North Kingstown RI is a great town with a lot of salt water frontage and growing commercial opportunities. Located centrally in RI, NK home to Quonset Point and the Davisville Air Show also has a thriving arts community centered around Historic Wickford Village. Wickford, a shake and shingle town, is a departure from the brick buildings in the historic section of nearby East Greenwich. With a median home value of $293,100, North Kingstown is a more affordable option than neighboring East Greenwich and Narragansett as well. The school has been recently remodeled and North Kingstown residents love the convenience of this centrally located town where the real estate market is hot! For an instant free home valuation of your North Kingstown property please feel free to click the link and become a market insider. 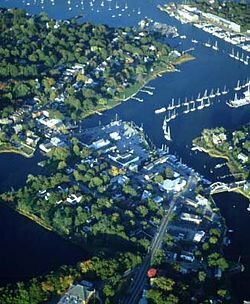 Overhead view of the harbor at Wickford Village.